CASTEAU, Belgium -- NATO's new supreme allied commander, U.S. Army Gen. Curtis Scaparrotti, said Wednesday the alliance should consider what weaponry it could provide so Ukraine can better combat a pro-Moscow insurgency. NATO's supreme allied commander Europe U.S. Army General Curtis M. Scaparrotti addresses the media after a change of command ceremony at NATO military headquarters in Mons, southern Belgium on Wednesday May 4, 2016. U.S. Army General Curtis M. Scaparrotti was installed as NATO's 18th supreme allied commander Europe (SACEUR). The commander, by tradition an American general or admiral, is responsible for the overall direction and conduct of NATO's global military operations. 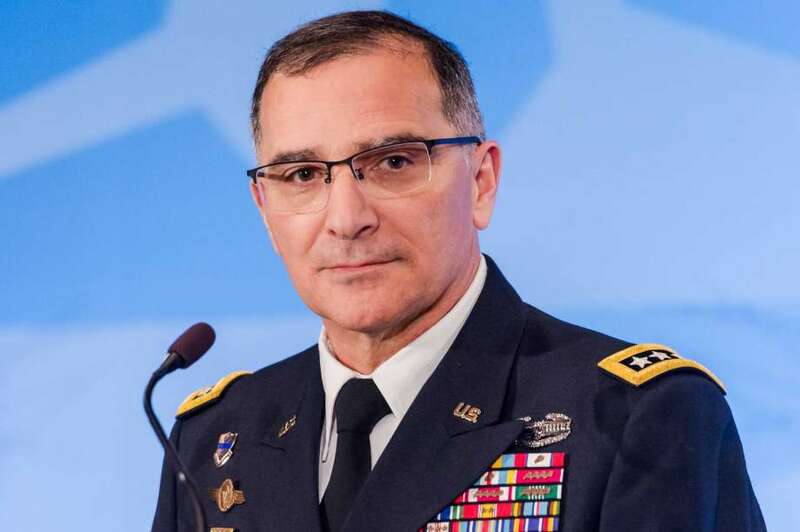 "I do believe that we should support the Ukrainians with what they need to successfully defend their territory and their sovereignty," Scaparrotti said. The four-star general made the remarks to reporters about an hour after taking over as military leader responsible for the overall direction and conduct of global military operations at the 28-nation NATO alliance. The command job, known in NATO jargon as the SACEUR, always goes to an American general or admiral, and was first filled by Gen. Dwight D. Eisenhower in 1951. Scaparrotti, 60, a West Point graduate and the former commander of U.S. and U.N. forces in Korea, succeeds U.S. Air Force Gen. Philip M. Breedlove, who was SACEUR for three years and oversaw sweeping changes at NATO designed to deal with a resurgent Russia and the threat of armed Islamic extremism in the Middle East and Africa. The new NATO commander said he expected to have only "limited" communications with the top Russian brass until Moscow begins adhering again to international norms and laws. He said the Kremlin continues to be active militarily in eastern Ukraine —a charge from the West that Russians officials routinely and flatly deny— and that the U.S.-led NATO alliance should reconsider what sort of concrete assistance it can give Ukraine. "Now, I'll take a look at that as the SACEUR, specifically because I need to assess what weapons are best, what capabilities they can use, what capabilities are complementary to their forces today," Scaparrotti said. "And I'll make the more refined decision here as I get into this job." Bless you, General Scaparrotti.....you are a credit to your uniform.